Among many wild and beautiful streams in the Santa Lucia Mountains, the North Fork of the Little Sur River stands out as one of the wildest and most beautiful. 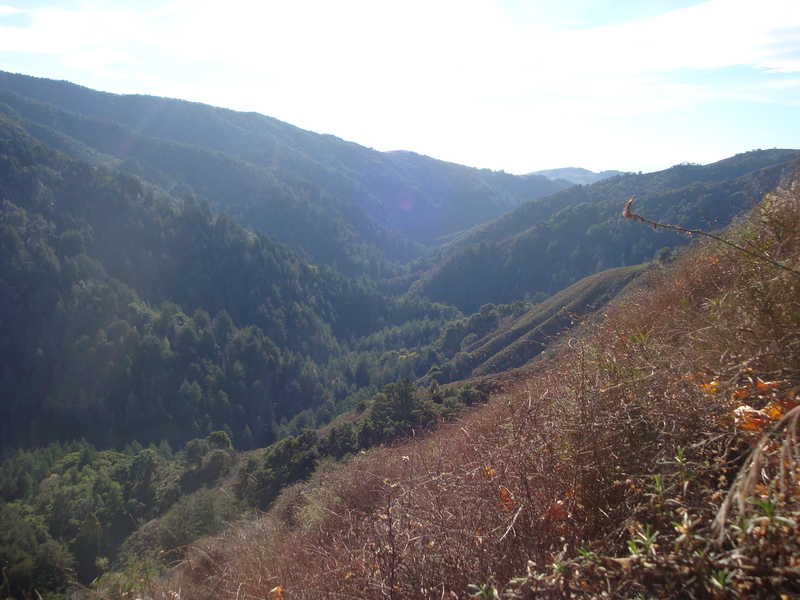 Rising on the north face of the Double Cone, it drains a deep, nearly trail-less, basin heavily forested with redwood and, unusually for the Santa Lucia, Douglas Fir; then squeezes through the narrow gap between Pico Blanco and Bixby Mountain to reach the coast. Somewhere in that deep, twisting gorge, which we can say from personal experience takes a lot longer to traverse than you’d figure from looking at the map, Mike Marshall lost his life – probably on March 30. The river wasn’t particularly high on that day, or in the days that followed; probably a couple hundred cubic feet per second at most. Nothing approaching the thousands of cubic feet per second which frequently flow through that canyon during major winter storms in wet years. But that’s what made it dangerous. Just enough water to fill the stream bottom and drive wanderers onto the steep slippery bedrock along the sides. Not enough water to look particularly risky, but more than enough to overpower even a strong swimmer in the narrow passages. He was probably experienced enough not to try to ford the stream in an unsafe spot, so more likely he simply slipped while trying to bypass some difficulty. Although lots of inexperienced and/or risk-seeking people visit the Santa Lucias every year, fatal accidents are exceedingly rare. We can’t think of anyone else being swept to their death in a stream since Bill Cotta and his horse famously lost their lives in Lost Valley Creek in 1963 (drunks in the Arroyo Seco gorge excluded). Still, it would be easy to say that he was foolish to go there with even a moderate flow. Or that he and his buddy should have stayed closer together. But the truth is that most of us who wander off-trail in the Santa Lucias regularly take small risks – dicey climbs around waterfalls and pools, etc. – that with a generous enough helping of bad luck could turn into serious accidents. An element of risk is part of the price of admission to some of the planet’s most worthwhile spots. In mountaineering, as in life, risk cannot be eliminated. It can only be managed. The trick is in being experienced enough to accurately evaluate the level of risk and in being aware enough to make a clear-headed decision about the level of risk one is willing to accept. That’s about all you can do. While Mike’s death is obviously tragic, perhaps his family and friends will be able to find some comfort in the thought that he departed life in the middle of one of the greatest places on earth, doing something that he loved. There are a lot worse ways to go. This entry was posted on Thursday, April 12th, 2012 at 2:26 pm and is filed under Big Sur, Santa Lucias. You can follow any responses to this entry through the RSS 2.0 feed. You can leave a response, or trackback from your own site. One of the best written pieces you have done….Bravo. Excellent story, my thoughts and prayers are with Mike’s family.